Lichfield Re:Cycle received a grant of £600 from Lichfield Conduit Lands Trust to trial a trishaw capable of carrying people and to explore the possibilities of setting up a Cycling Without Age (CWA) chapter or similar project and to train their volunteers. In January 2018 Lichfield Re:Cycle became an affiliate of CWA with the exclusive right to form a Lichfield chapter. On 7th February 2018 Lichfield Re:Cycle hosted a national CWA gathering with Lichfield District Council to which interested people and groups from across the country came. 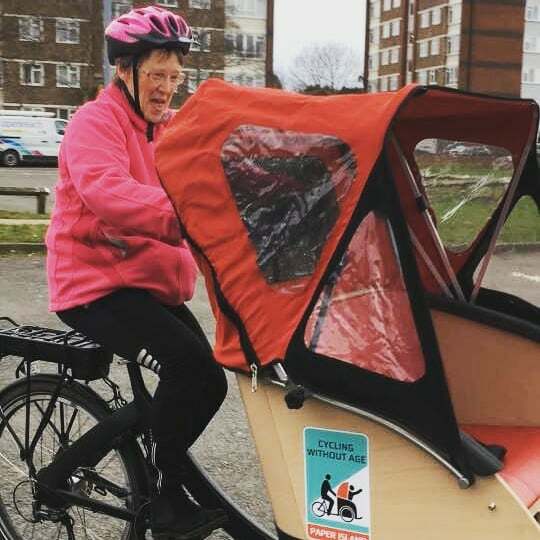 On 16th February 2018 Lichfield Re:Cycle volunteers travelled to Seaford in Sussex to collect ‘Annie’, a Triobike trishaw that is loaned to new chapters and affiliates in the UK. We had the trishaw to trial until the end of March 2018. During the trial period Lichfield District Council agreed for us to store the bike in a secure place in the Friary car park. As well as trialling the capabilities and limitations of the trishaw we have embarked on a series of meetings and demonstrations with organisations and bodies that may be interested in supporting, funding, utilising or sustaining a trishaw project in the Lichfield District. He then got in touch with a civil society consultant from the City of Copenhagen, Dorthe Pedersen (now Cycling Without Age), who was intrigued by the idea and together they bought the first 5 trishaws and launched Cycling Without Age, which has now spread to all corners of Denmark, and since 2015 to another 38 countries around the world. We dream of creating a world together, in which the access to active citizenship creates happiness among our fellow elderly citizens by providing them with an opportunity to remain an active part of society and the local community. That way we build bridges between generations and we reinforce trust, respect and the social glue in our society. The feedback from the people in Seaford on their limited experience of the trishaw included: it was hard to brake with both hands going downhill and to signal at the same time, they said they would want to carry a spare battery as they felt there was only a range of about 20 miles, the gearing was not sufficient for all of the hills in their area so should they purchase this trishaw they would need to modify the gearing. We haven’t encountered any physical obstructions that have prevented the trishaw getting anywhere in Lichfield. It fits between bollards and gates to enter and exit Beacon Park at any point. Also at places like the crossing on the A51 it passed there fine. It really does like to be on flat and smooth terrain and riding it you realise much more than on two wheels how uneven many surfaces are, both on the road and the cycle paths. Camber, potholes, tree roots raising and breaking the surface are just some of the things that are hard to avoid on three wheels. Fully loaded there are some hills that quickly drain the battery or are best avoided. It also takes a fair bit longer to ride from A to B on the trishaw, it not being as nippy as a two wheel bike and also because it is suited to riding at a low speed. Therefore when using it in Lichfield it may be well suited to using the cycle path spine from Netherstowe through Beacon Park and then on to the cycle path round, or promenade through, the Darwin Estate. We tried it on the footpath that forms a 1 mile loop on the estate but the surface was not suitable or comfortable for the passenger. With the current sprung Brooks saddle that is fitted the minimum rider height will be around 5 foot 3 inches. With a different saddle this could be a little lower. When loaded there is a limit to the sort of terrain the bike can manage even with the power assist and a general level of fitness is required to operate the bike. The recommended load in the front of the bike is limited to 160kg and 250kg payload overall. It would be useful to have a second volunteer as an outrider and helper to get people in and out. If the front is fully loaded and someone tries to get out, especially without removing the footplate, the pilot needs to hold the bike down to prevent it tipping with the weight of the passengers. The cost to purchase the Triobike Taxi is around £6000. This could be less if purchased by a charity without having to pay VAT. The annual cost to insure, train and maintain the bike and volunteers could be anywhere up to £2000. This would include regular servicing including parts and labour, liability and theft insurance, first aid training, rider training and DBS check costs (this is an insurance requirement for pilots). For the bike to be in regular use this will require resources to administrate the bookings, develop relationships with users, training and supervision of volunteers etc. To do this we estimate it could take as much as 30 person hours a week for one bike, almost a full time equivalent job for one person or to be shared among a number of committed volunteers. This is likely to be less of a commitment during winter months due to limitations and the weather. Although the rides in the trishaw are free for those who take them, there are other ways to recover some of these costs or find income to offer more capacity to deliver rides. These could include sponsorship, agreements with business to pay for their clients to use the service, grant funding, donations, subscriptions and crowdfunding. The local cycling/road infrastructure including terrain and the trishaws own limitations means there are places in Lichfield where it will be harder to get to and the rural areas of the district may not be reachable without transport (van or trailer) to get the bike there. Lichfield Re:Cycle trustees considered a number of options based on the report produced and summarised above. There was much greater detail in the report that is not included in this summary. The trustees felt that by taking on a trishaw project and fulfilling the potential of Cycling Without Age affiliation, this would drastically change the other activities the project currently undertakes. To prevent this drastically changing what Lichfield Re:Cycle currently does, the trustees would need to considerably increase the voluntary capacity of the project to be able to deliver CWA in Lichfield. The trustees voted to decline the opportunity to set up a CWA chapter in Lichfield at this moment. As a result of this decision, one of the trustees of Lichfield Re:Cycle has decided to explore the setting up of a completely seperate group to work towards a trishaw project in the Lichfield District. Clare Rawlings has been heavily involved with the trial and she will take the learning from it and attempt to form a new group and recruit new volunteers and trustees to that group. They will then set about the task of raising the required funding and building a sustainable project. 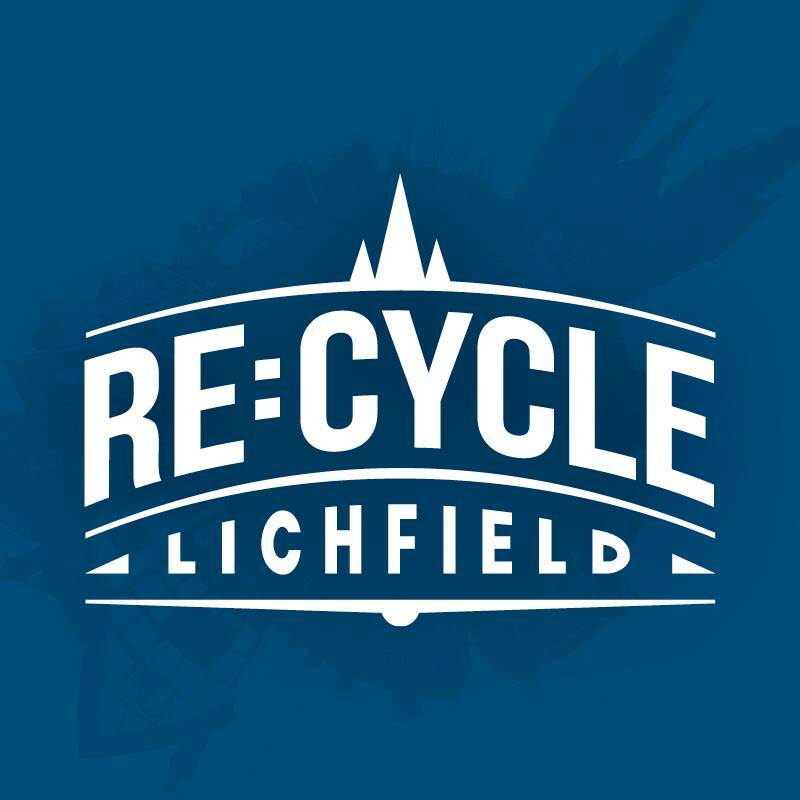 Lichfield Re:Cycle Trustees would like to thank: Lichfield Conduit Lands Trust, David Hollyoak at Lichfield Run & Ride, Lichfield District Council, Secura Labels and all the volunteers who contributed to this trial.